The Jamaican Flag was adopted on August 6, 1962, the country having gained independence from the British-protected Federation of the West Indies. The flag consists of a gold, which divides the flag into four sections: two of them green (top and bottom) and two black (hoist and fly). The present design emerged from those sent in by the public in a national competition. It was originally designed with horizontal stripes, but this was considered too similar to the Tanganyikan flag, and so the saltire was substituted. It hints at the Scottish and irish roots of much of the population, while black, green, and gold are Pan-African colors, representing the country's black majority population. An earlier interpretation of the colors were, "hardships there are but the land is green and the sun shineth": gold recalls the shining sun, black reflects hardships, and green represents the land. 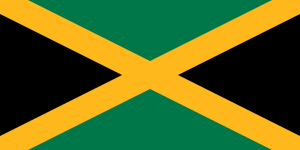 However, that was changed to the color black representing the strength and creativity of the people which has allowed them to overcome the odds, yellow for the golden sunshine and green for the lush vegetation of the island.